What’s the Maximum Expense Ratio Somebody Should Pay for a Mutual Fund? The maximum expense ratio that I would pay for a fund depends on the context. Specifically, it depends on the availability of a less expensive suitable substitute. A “total bond market” index fund with an expense ratio of 0.1%. Our investor has a dilemma. She wants a 20% international stock allocation in her portfolio. But she would have to pay an extra 0.6% per year for that part of the portfolio in order to have such an allocation (rather than just allocating the entire stock part of the portfolio to the US stock index fund). Frankly, if I were in that position, I wouldn’t pay the additional cost. I appreciate international diversification, but an avoidable cost of 0.6% per year is a high hurdle for the diversification to overcome in terms of added value. But what if our investor’s lowest-cost investment options were as follows? In this case, our hypothetical investor would now only be paying an additional 0.05% per year for her international allocation. The international fund’s cost hasn’t changed at all, but it has become quite a bit more attractive because the alternative (i.e., keeping the entire stock allocation in the US stock fund) has become more expensive. Point being: The maximum expense ratio that it makes sense to pay depends on the cost and suitability of the nearest substitute. In our first scenario the 0.7% expense ratio was too high because there was a low-cost substitute (albeit an imperfect substitute). In the second scenario, the 0.7% expense ratio was not prohibitive, because there was no low-cost substitute. What if There Are Multiple Accounts? In this case, however, her portfolio consists of $50,000 in her 401(k) and $50,000 in a Vanguard IRA. In this case, she has no reason whatsoever to pay the high cost of the international fund in her 401(k), because she could achieve her desired overall allocation by buying an international index fund/ETF in her IRA. Again, the overall conclusion is that the maximum “acceptable” expense ratio for a fund varies based on the availability of less expensive suitable substitutes. Investing Blog Roundup: What Drives Muni Bond Yields? Relative to Treasury bonds, muni bonds often yield more than we would expect based on just the different tax treatment and different credit risk of the two types of bonds. So what’s the other characteristic of muni bonds that drives their yields up? Larry Swedroe takes a look at that question in an article this week at Advisor Perspectives. Why Don’t Vanguard’s Target Retirement and LifeStrategy Funds Own Admiral Shares? One question I receive periodically is why the Target Retirement and LifeStrategy funds at Vanguard hold “Investor” shares of the underlying funds, rather than the less expensive “Admiral” shares. Emily Farrell, Head of U.S. Business PR at Vanguard, was kind enough to provide the answer. Piper: Why don’t the LifeStrategy and Target Retirement funds use Admiral shares as the underlying holdings? Or, if there’s a concern about that being a way to “cheat” to get access to Admiral shares without meeting the requirements, why not have an Admiral share class for the LifeStrategy and Target Retirement Funds, with a higher minimum investment (i.e., a high enough figure such that a person investing that amount via an identical DIY allocation would qualify for Admiral shares of all or most of the underlying funds)? Farrell: Vanguard is unable to offer multiple share classes on funds of funds due to the structure in which we operate, and the agreement we have with the SEC regarding multiple share classes. Our funds of funds have no direct costs — the costs are derived only from the ERs of the underlying funds. According to that agreement, we must be able to offer a differentiated cost advantage between share classes. (Therefore, because there is no direct cost associated with a fund of fund — it’s not possible for us to offer such an advantage). As you may recall, we launched a suite of Institutional TRFs in 2015. Note, however, those are not share classes — they are an entirely new set of mutual funds. Piper: Given that Vanguard can only have one share class of a fund-of-funds, how does Vanguard decide which share classes to hold within such funds? The “normal” (non-institutional) versions of the funds-of-funds each hold Investor shares of the underlying funds. Would Vanguard ever consider holding Admiral share classes in these funds? And, for example, the Vanguard Institutional Target Retirement 2050 Fund (VTRLX) holds Institutional shares of one underlying fund, Admiral shares of another fund, and Investor shares of two funds. What’s the line of thinking there? Farrell: It is largely based on the cost to serve the underlying shareholder of the TRF or LifeStrategy Fund. These funds tend to attract small balance accounts and IRAs, and the cost to serve is disproportionately higher than funds with large and diverse shareholders. In terms of looking into adding holding Admiral in the Investor suite of TRFs, in short, the answer is yes — we consistently review our products, product structures, and product line-ups. However, given the size of the average TRF account and our cost allocation methodologies, we would not expect a change from Investor Shares. Specific to the underlying holdings of the Institutional suite of TRFs, again, it is cost to service the funds and our cost allocation methodologies that dictate the share class utilized. So, to paraphrase, Vanguard’s position here is, “in a Target Retirement or LifeStrategy fund, we hold whichever share class (or share classes) result in an expense ratio that most closely reflects the cost to service the fund’s shareholders.” In hindsight, that feels sort of obvious, given Vanguard’s general “at cost” pricing philosophy. What Does an Investment Portfolio Need? I recently encountered a conversation about the characteristics of a good portfolio. The person speaking (whom I didn’t know) had a long list, but it got me thinking about what I would include on such a list. An appropriate overall level of risk. With regard to diversification, the most critical thing is diversification among individual holdings (unless we’re talking about FDIC-insured CDs or Treasury bonds, for which diversification isn’t needed). Point being: Don’t set yourself up for financial catastrophe if a single company goes out of business. Also helpful, but less important, is diversification among asset classes — have some stocks and some fixed-income. With regard to costs, the lower you can get the better. But it’s important to think in dollars rather than proportions. For instance, the difference between an expense ratio of 0.8% and an expense ratio of 0.2% is much greater than the difference between 0.2% and 0.05%, even though in each case the less expensive option is 1/4 as costly as the more expensive option. On a number of occasions I’ve heard from people considering changing fund companies in order to shave just a few hundredths of a percent off their average expense ratio. It would be rare for such a change to be worth the hassle for anything other than a very large portfolio. When it comes to choosing an appropriate level of risk, it’s important to know that this is a very rough thing. Your risk tolerance isn’t something that can be measured precisely. In addition, your risk tolerance will change over time. (And the riskiness of different combinations of investments changes over time too!) Finding something that feels “approximately right” for you is as good as you’re ever going to get here. The reason I’m such a big fan of index funds (and/or ETFs) is that, in most cases, it’s easier to achieve each of the three goals above by using index funds. Index funds are typically very well diversified, with very low costs. And it’s easy to achieve any particular level of risk with index funds. But the above goals certainly can be achieved with actively managed funds. Vanguard, for instance, has a long list of actively managed funds with super low costs. For many investors — myself included — “simplicity” would also be on the list of characteristics that improve a portfolio. 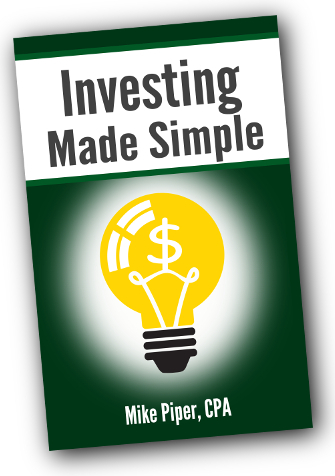 And simplicity is also aided by the use of index funds or ETFs. But I’ve left it off the list because some people truly do not care about it. They’re perfectly happy to manage portfolios with 10 different funds across several different accounts. And there’s nothing wrong with that. If I’m playing blackjack and I choose to hit on 18, I have made a bad decision. Even if I get a 3 and win a bunch of money on the hand, it was still a bad decision — just one that happened to have a lucky outcome. Point being: A decision is good or bad based on what was known at the time of the decision, not based on how it turned out. In the context of a card game, this is all fairly obvious. But it trips people up when it comes to investing. Like card games, investing involves a significant degree of randomness. As a result, it’s not rare for good decisions to have bad outcomes or for bad decisions to have good outcomes. Over the course of your investment career, you will almost surely make some good decisions that turn out poorly — or vice versa. The problem in investing, however, is that people often evaluate a decision based purely on its outcome, causing them to sometimes “learn” a faulty lesson in the process (the equivalent of “learning” that it’s a good idea to hit on 18 in blackjack). For instance, it’s a mistake for most people to pick individual stocks, given that doing so usually increases risk and reduces expected return relative to using an index fund. Similarly, it’s a mistake to put money into an actively managed mutual fund just because it’s “hot” right now, given that most actively managed funds underperform their benchmark and given that even actively managed funds with winning track records tend not to continue to win. But either of those poor decisions could actually turn out very well. Of course, in the short-term that would be a good thing. (Can’t complain about good returns!) But it’s dangerous if it leads a person to conclude that the decision was wise and should be repeated. Conversely, if you have a portfolio of expensive actively managed funds and you decide to move your money into lower cost investments, you’ve made a smart decision. Even if your old portfolio (the portfolio that you abandoned in favor of a less expensive option) happens to perform well over the immediate future, you wouldn’t want to conclude that the change was a mistake. Overall point: Be wary of doing something just because it’s worked well for you in the past. And be similarly cautious about avoiding something just because it hasn’t worked well for you in the past.